Today I’m celebrating five years with this guy! Well, five years ago today, we became “official” at least. We had our first kiss on Halloween of 2006 and our first date on Valentine’s Day of 2007. Slow and steady wins the race! On our first date, I was extremely brave and ordered the most bland thing I could find on the menu, Roast Chicken. For me, that was pretty big, seeing as I only ate grilled cheese and macaroni at that point in time. I was tempted to ask for a kids menu (that’s what I always used to do! ), but I decided to put my big girl hat on :). My parents used to say that I was a cheap date, but Luke sure changed that! Delta Gamma Formal, 5 years ago today. Favorite photo together – Kennebunkport, Maine, July 2007. We asked this Japanese tourist to take our picture and he told us to kiss and kept making smoochy faces at us. 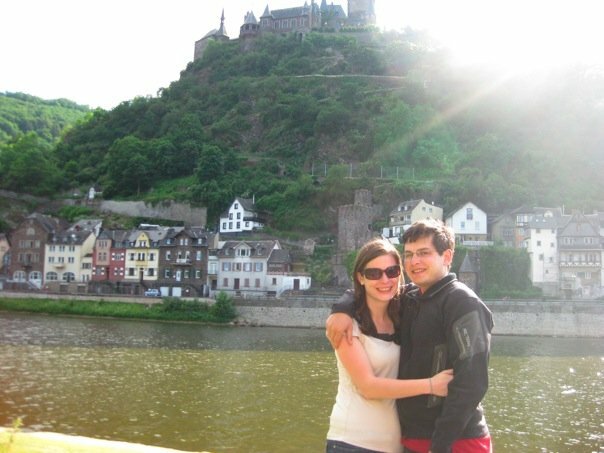 Favorite place we’ve traveled to: Cochem, Germany, June 2009. 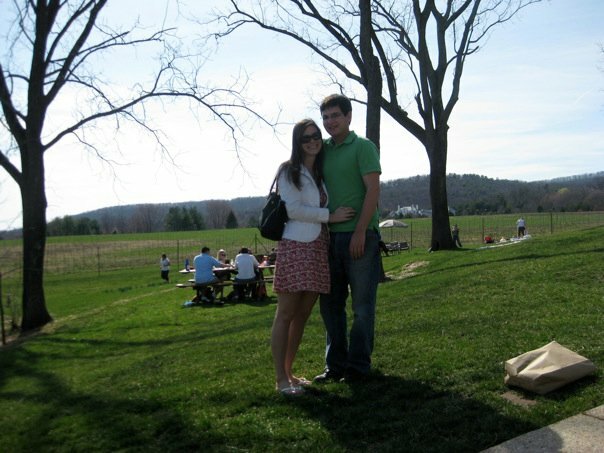 Favorite Anniversary: our 3rd, in the Virginia Wine Country. 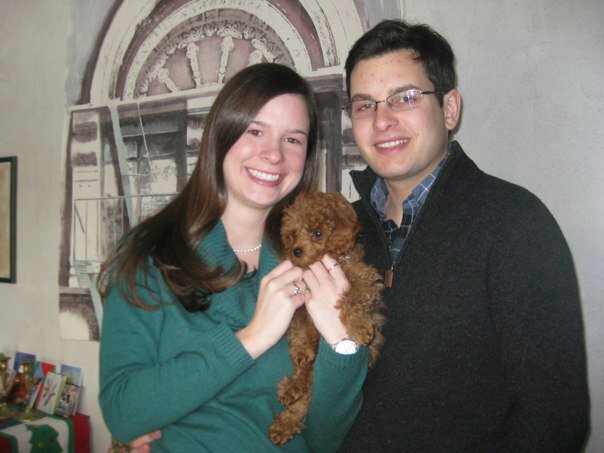 Favorite milestone: Getting Teddy! 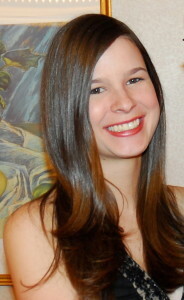 January, 2011. It’s been a good five years! We will hopefully be celebrating by going to Kennebunkport, Maine this weekend and maybe opening one of the wines we’ve been aging since we first went to the Virginia vineyards back in 2009. It’s as good of an occasion as any to open a special bottle! 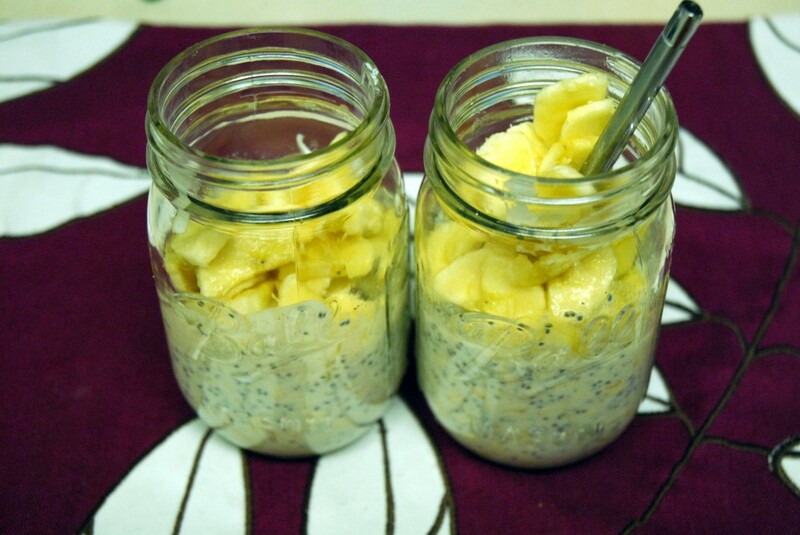 We started off the day with his and hers batches of my new overnight oat concoction: Banana Bread Overnight Oats. While I still wasn’t able to get appetizing pictures of the oats (I don’t know how people ever manage to make overnight oats look pretty! ), I was able to pin down the ingredients so that I could share the recipe. Just mix all of the ingredients together (except the bananas). Then add the bananas and stir again. Cover and refrigerate overnight. Stir again in the morning and enjoy! Mix all ingredients, except bananas, together in a bowl or jar. Once everything is mixed well, add in the bananas and stir to combine. 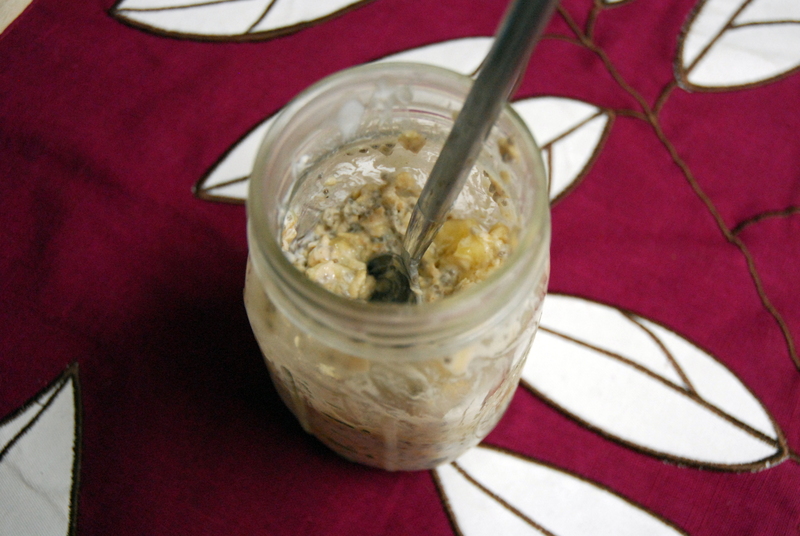 This entry was posted in Breakfast, Gluten-free, Overnight Oats, Recipes, Teddy and tagged banana, breakfast, overnight oats. Bookmark the permalink. You two are adorable! Love the pic of you two kissing. So darling. Thank you! It’s hard to believe that pic was almost 5 years ago too! Thank you! Did you recognize the yuma house? 🙂 And the first couple times I made overnight oats I didn’t like them at all. I didn’t make them again for a couple months and then finally gave them another shot and found out how I can make them so that I like them! Aww Happy Anniversary to you two! You guys are adorable together! Is Teddy both of yours? Thanks! Luke bought Teddy for me as a present (though not for any special occasion). He’s both of ours but he’s 51% mine and 49% Luke’s :). I’m the one who mostly takes care of him! This might be a dumb question… But i just prepared this recipe, but being my first time ever having them prepared over night, how long do i zap it all in the am? They’re actually meant to be eaten cold – so all you do is give them a stir in the morning. You probably could put them in the microwave for 30 seconds if you wanted hot oats, but I’ve never tried that. Not a stupid question though! 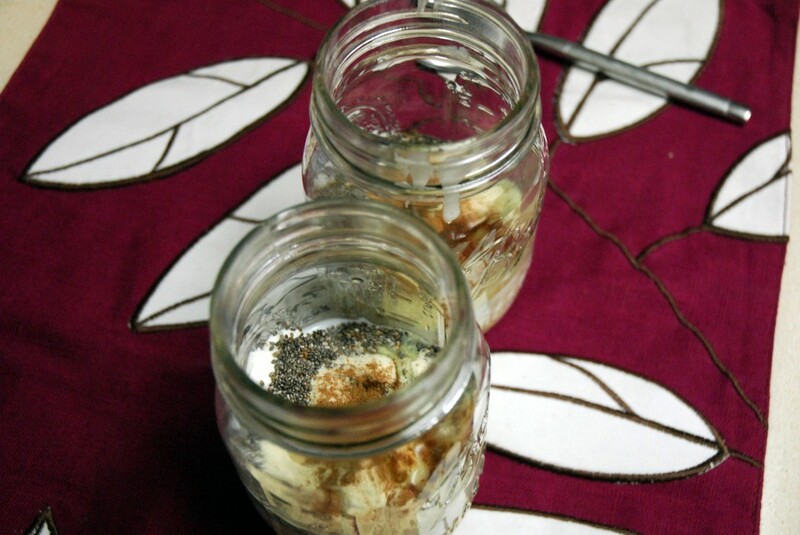 Most people have never even heard of overnight oats 🙂 I hope you like them!